Around this time of the year I entertain thoughts of visiting Bermondsey market. The problem is that you have to get up very early to do it. Situated on the other side of Tower Bridge, it has become a shadow of itself in the last decade, thanks to rampant property development. It’s also a parking nightmare, and better to go by public transport. It used to be called the New Caledonian Market, having been relocated from North London (the actress Valerie Hobson opened it in 1949), but because it’s in Bermondsey Square people changed the name. Bermondsey is a ‘market ouvert’, following an ancient law which was finally repealed just five years ago. Under this law, if you sold an item between sunrise and sunset then its provenance couldn’t be questioned, so stolen goods could be traded without any legal comeback on the buyer. It’s amazing how many Londoners don’t know it exists. Tourists are often better informed than we are. The old law meant you used to get a lot of stolen goods turning up. But the market actually opens before dawn, so you need a torch to check out the goods. 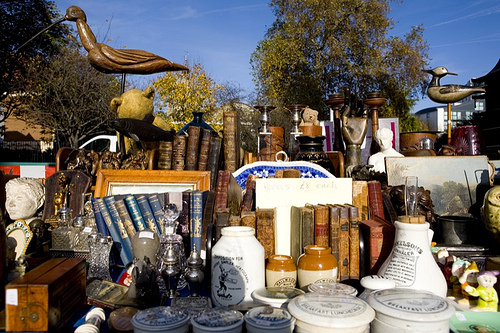 This is where it gets tricky, because although there are many cheap items, you could also pay a fortune for a dud, which is why Bermondsey is something of an experts’ market. 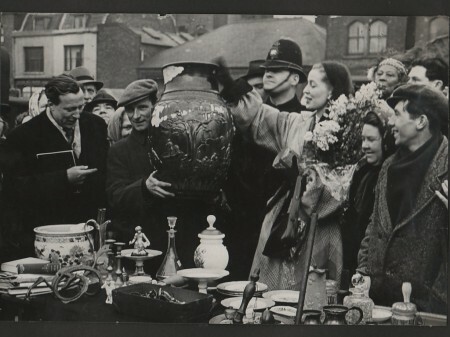 They also seem to get runs of particular goods, especially Georgian and Victorian bric-a-brac. I once went there and it seemed that everyone was selling Victorian death albums, those memento mori volumes on wooden stands where you posed your dead child with the family. The best part is hot sarsparilla and sausages on a cold morning. It’s still probably worth a look today. Especially after seeing Acorn Antiques. Bermondsey’s my second favorite market, after Portobello, which wins out due to its sheer size. I haven’t been in a few years, but plan to check it out again when I’m in town for the London Book Fair next April.